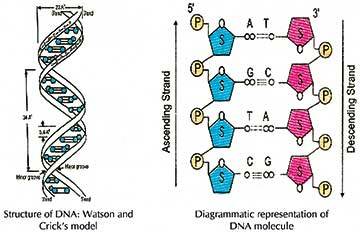 DNA is a nucleic acid (NA) with deoxyribose (D) sugar molecules. Its complex structure can be broken down into simple chemical blocks of sugar, base, and phosphate group, which together constitute the nucleotide. Yes, DNA is unaware of what we are doing with our knowledge of its structure after 60 years of its discovery! We are decoding the genetic recipe of life forms on the planet through genome sequencing, creating genetic profiles, manipulating the genetic sequences, recombining, mining and engineering them, modelling and designing artificial nucleic acid structures and so on. All this is possible because we know the chemistry of DNA. In this article, I’ll focus on elementary chemistry concepts which form the basis for the understanding of the DNA structure. A brief on DNA’s structural discovery and details follow. In late 1920s, the chemical components of DNA were identified to be phosphate, sugar, and base by Phoebus Levene, an American biochemist. Levene showed that the three components were linked in the same order as above to form a chemical unit, which he termed – ‘nucleotide’. There was speculation regarding the actual structure of the DNA molecule but it was only in 1953 that the structure was discovered, to what Henderson (2008) says is a story of luck, brilliance, and deviousness. 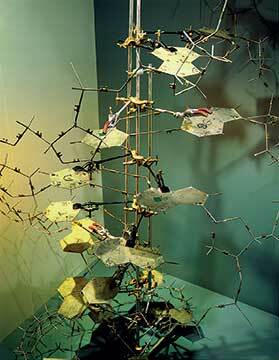 There were two major insights that led to the discovery of the structure of the deoxyribonucleic acid (DNA) molecule. The first came from the work of an Austrian biochemist, Erwin Chargaff. In 1952, while based in Columbia University in the United States, through meticulously designed experiments and with the use of paper chromatography technique, Chargaff gave two rules concerning the chemical composition of DNA. These rules suggest that in a double stranded DNA molecule, the amount of Adenine (A) base equals Thymine (T), and the amount of Guanine (G) base equals Cytosine (C). Also, that the base composition of DNA varies from one organism to the other. 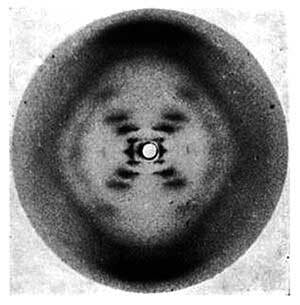 "Photograph 51": X-ray diffraction photograph of a (B)DNA molecule. The second insight came from the work of a British biophysicist, Rosalind E. Franklin and her student, Raymond Gosling at King’s College in United Kingdom. In summer of 1952, Gosling and Franklin took an X-ray photograph of the B form of DNA. This photograph is famously known as ‘Photo 51’. The X-shaped diffraction pattern of the photograph suggests that the molecule is helical. The four diamond patterns that are formed by the arms and legs of the ‘X’ indicate helix repeats along the molecular axis. Careful examination also reveals that the left and right diamond patterns are not so clear as the top and bottom patterns. This suggests that the sugar and phosphate backbone is on the outside and the bases are on the inside (Krock, 2003). While working in the Cavendish laboratory at Cambridge, an American and a British molecular biologist, James D. Watson and Francis Crick, built upon the above two insights and started playing with tin and cardboard models of DNA’s chemical components to test possible structures. Model building proved to be rewarding as Watson realized that A-T and G-C pairs were structurally similar; specifically, the length of the two base pairs were equal. The pieces of the jigsaw puzzle were now fitting perfectly; the double helical structure of DNA was discovered! Watson and Crick published their model of DNA structure in early 1953 and won the Nobel prize for their seminal work in 1962, along with Maurice Wilkins, a British physicist and molecular biologist who had been working on X-ray diffraction of DNA and who had helped them gain access to ‘photo 51’. DNA is a double helical molecule, where each helix is composed of a deoxyribose sugar-phosphate backbone, and each sugar molecule is attached to a purine (Adenine or Guanine) or a pyrimidine (Thymine or Cytosine) nitrogenous base to form a ‘nucleoside’ unit. Molecular diagram of unwounded DNA depicting two nucleotide pairs. Created through Inkscape. The sugar of the nucleoside unit is combined with phosphate group on the outside to form a nucleotide unit. One nucleotide unit is hydrogen bonded with the nucleotide unit of the other helix through the bases. The nitrogenous bases are paired in a complementary manner, where a purine base is paired with a pyrimidine base such that the overall length of the base pairs are preserved. The purine A forms two hydrogen bonds with the pyrimidine T, and the purine G forms three hydrogen bonds with the pyrimidine C. The base pairs are planar ring structures which are placed perpendicular to the axis of the molecule and to the sugar molecules (Woski & Schmidt, 2002). Where does chemistry come in? In the Indian education system textbooks remain one of the most influential resources for disseminating knowledge and therefore could be held liable for seeding concepts in receptive minds. The concept of ‘DNA structure’ enters the Indian biology classroom in higher secondary grade, and standard biology textbooks introduce it as part of a bigger chapter on ‘biomolecules’ or ‘biotechnology’ (NCERT, XI; MSBSHSE, XII). There are differences in the style of presentation across different boards but the content usually revolves around elaboration of the three major components and the dimensional details of the helical structure of the DNA molecule. 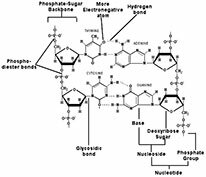 One can find a range of diagrammatic representations across these textbooks, but what remains more impressive about them is emphasis on the helical nature and the schematic representation of phosphate-sugar-base composition of the biomolecule (see figure). The accompanying text elaborates on the above two aspects. There is indeed a description on the pentose form of the sugar, its attachment to a ‘larger’ purine or a ‘smaller’ pyrimidine molecule, the ‘two’ and the ‘three’ number of hydrogen bonds between the ‘A-T’ & ‘G-C’ base pairs respectively, the sugar-phosphate repeats forming the backbone, and the anti-parallel nature of the two helical strands. The description seems to be good for an introduction but there are subtle concepts which are left out for the students to figure out. These concepts are likely to be left out for two plausible reasons: a) the textbook has to fit in a lot of information within given space constraints, and/or b) the content has already been handled in some other textbook at some different point of time and students are expected to recall and apply those pieces of information appropriately. When I was in higher secondary school (that was back in 2001), and was going through my biology textbook to make sense of that ‘very complex molecule’ (as my teacher used to call it and I still hear it quite often) for a mid-term exam, I kept wondering what on earth made one strand of DNA run in ‘5’ to 3′ direction’ and the other in ‘3’ to 5′ direction’? I re-read the textbook, asked my teacher, and the only response I got was that it was because DNA is ‘anti-parallel’. I failed to see how the ‘5 prime’ and ‘3 prime’ were connected with the ‘anti-parallel’ concept. It was only during my graduation that I realized that I didn’t know the numbering pattern of the sugar molecule and the ‘3 prime’ and ‘5 prime’ actually refer to the 3′ and 5′ carbon atom positions of the sugar molecule. Even though my ignorance did me no harm (I scored well in the exams! ), it revealed a sticky point, a wish to have known the concept in my higher secondary. I still think, I deserved to have known it. It might be argued that exposing me to complete molecular structure of the biomolecule at that point of time would have landed me in a cognitive mess. But, I do not agree that there was no other way to alleviate my confusion. Now, I know that a little bit of chemistry would have rescued me from the mental trouble. The concept of DNA structure provides ample opportunity for teachers and educators to integrate elementary concepts from chemistry. In this section, I’ll highlight a few elementary chemistry concepts, which, if re-visited, could help biology students better understand the DNA structure. It might appear trivial to include the concept of an atom in a higher secondary class discussion. Nevertheless, it is significant to re-visit this concept for it helps learners to appreciate the atomic differences between nitrogenous bases, sugar molecule and phosphate group. When a learner traverses the path from an atom to a molecule, her prior understanding of electronic configuration of the atom(s), concept of valency(ies), and the concept of chemical bonding is invoked. Chemical bonding is particularly important for it will help the learner to understand the nuances of covalent and hydrogen bonds, which is utilized in the DNA structure. Involving learners in the exercise of building bonds and asking them to give illustrative examples of covalent and hydrogen bonds (as in ammonia, water) will help students relate to the significance of two and three hydrogen bonds between the nitrogenous bases. When learners are fiddling with the concept of hydrogen bonding, they’ll have to visit the concept of electro-negativity, the ability of an atom to attract the shared pairs of electrons toward itself. A small discussion on why oxygen and nitrogen are more electro-negative than hydrogen will help the learners know the basis of hydrogen bonding. That the DNA bases are the same bases that students have learned in their chemistry classes on ‘Acids, Bases and Salts’ might seem obvious, but it may not be for the learners. A discussion on this similarity by invoking the properties of bases will help them relate the chemical concept with the biological one. One hydroxyl group (OH) from one molecule combines with a hydrogen (H) atom from another molecule and gets released in the form of water (H2O) molecule. In this process, a chemical bond gets formed between the two participating molecules. The phosphate-sugar bond and the sugar-nitrogenous base bond in DNA are formed in a similar manner and the two bonds are called ‘phospho-diester’ bonds and ‘glycosidic’ bonds respectively. A discussion on this condensation reaction will help learners appreciate the basis for nucleoside and nucleotide formation. Nitrogenous bases have 1, 2, 3… as numbers for their carbon positions and sugar molecule have 1′, 2′, 3’…as numbers for their carbon positions. This is not so preliminary a concept, but it will help resolve issues concerning the ‘3 prime’ and ‘5 prime’ end and ‘anti-parallel’ nature of the DNA molecule. The suggestions in this article are largely derived from the findings of a small research study that I conducted with first year biology undergraduate students at my institute (HBCSE, TIFR). This study focused on students’ understanding about the DNA structure and brought to fore a few interesting observations. One was students crossing the DNA backbones (of a flexible physical DNA model made of clothespins) and trying to press them along with the bases flat on to a table, as if, trying to faithfully replicate the textbook representation (see last figure) of a DNA molecule (Srivastava & Ramadas, 2013). Research suggests that this difficulty of translating a 2-D representation into its corresponding 3-D form can be mitigated through the use of models and making learners visually literate. Using simple physical models (e.g. a rope, clothespin model with differentially colored clothespins and tubes) along with the relevant chemistry discussion will help learners visualize and connect different concepts in an appropriate manner. Naturally, the teacher must remember to clearly describe which aspects of the physical model bear relation to the concept being discussed and which don’t. When I was in my school days, biology and chemistry seemed to be two different and exclusive sciences, one was concerned with living organisms and the other with chemical substances. The boundaries were neat. My trouble with the structure of the DNA molecule is one of the instances which led me to think about the role of relations, connections and the network of concepts. The realization that the most civilized animal on earth has created boundaries to understand the world better, made me more open and receptive as a person. To summarize, the pedagogical compartmentalization of biology and chemistry, while a useful device, creates some conceptual blindspots during the introduction to basic biochemistry concepts at the higher secondary level. I propose that a brief review (taking no more than 1-2 lectures) of the relevant chemistry details along with the use of appropriate physical models will yield a deeper and more comprehensive understanding of the structure of DNA molecules for students, thereby creating richer opportunities for engaging with biochemistry in higher studies. Henderson, M. (2008). 50 genetics ideas you really need to know. London: Quercus. Maharashtra State Board of Secondary and Higher Secondary Education. (2009). Biotechnology. In Standard XII ‘Biology’, Chapter 2 (pp. 13-33). Pune: MSBSHSE. National Council of Educational Research and Training (2013). Biomolecules. In ‘Biology textbook for class XI’, Chapter 9. New Delhi: NCERT. Srivastava, A., & Ramadas, J. (2013). Analogy and Gesture for Mental Visualization of DNA Structure. In Multiple Representations in Biological Education (pp. 311-329). Springer: Netherlands. Woski, S. A., & Schmidt, F. J. (2002). DNA and RNA: Composition and structure. In T. M. Devlin (Ed. ), Textbook of biochemistry with clinical correlations (5th Ed.) (pp. 27-92). New York: Wiley-Liss. The author is a research scholar at Homi Bhabha Centre for Science Education, Mumbai. A part of her work with undergraduate students’ understanding of DNA structure was recently published in the book – “Multiple Representations in Biological Education” (2013). She is currently involved in exploring cognitive processes and strategies of students as they participate in tasks related to the DNA structure. She can be reached at anveshna@hbcse.tifr.res.in.